Nearly 80 percent of U.S. consumers either aren't interested in mobile wallet features that allow them to make payments with their smartphones, or haven't heard of the technology, according to a new online study by Retrevo, a consumer electronics review and shopping site. The report is sobering news for proponents of Near Field Communication (NFC), a technology that enables two-way interactions between a mobile device and a bank, credit card provider, retailer, or government agency. A shopper, for instance, could wave a smartphone over an NFC reader at a store to pay for a purchase. NFC garnered major media buzz last month when Google launched Google Wallet, an NFC-based mobile payment system that's built into the Android 2.3 operating system. Phones need special NFC chips to use Google Wallet, although a limited edition of the service may soon be available to non-NFC-enabled phones as well. Google Wallet trials will take place this summer in San Francisco and New York. NFC technology is widely used in Japan and South Korea, and is being introduced in some European cities. The Retrevo Pulse report shows that US consumers aren't enthusiastic about mobile wallet services, at least not presently. The online study of 1000 Americans of varying ages, genders, incomes, and locations indicates that just over half of consumers aren't interested in a mobile-wallet payment system. Another 26 percent say they don't know what "NFC" or "mobile wallet" means. And just one in five people want to pay for items with their phone. 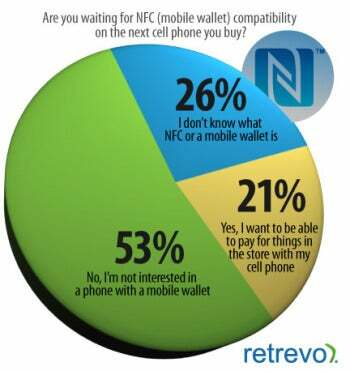 Despite Google's leadership role in the mobile payments, Apple iPhone users appear more enthusiastic about NFC technology. Forty percent of iPhone owners say they want to make payments with their next cell phone, versus only 24 percent of Android owners, according to study. The iPhone 4 isn't NFC-capable, and it's unclear whether the next-generation iPhone, rumored to debut in the fall, will support the technology. more mainstream. As Retrevo points out, however, NFC proponents have to do a better job of addressing consumers' concerns about security. When will Americans warm to NFC? When they start spotting early-adopter friends, colleagues, and random strangers paying for things with a simple swipe or tap of a phone.